Studies of cervical cancer mortality at the population level suggest an approach that may help clarify the effectiveness of mammography screening. A review of randomised trials on mammography screening carried out by an international expert group suggested that in areas with screening attendance of at least 70%, a reduction in breast cancer mortality by about 25% may be expected in women screened between 50 and 69 years of age and by about 19% in women screened between 40 and 49 years.6 Bearing in mind the experience with cytology screening for cervical cancer, the reduction in mortality in countries that implemented mammography screening early would be expected to appear before any reduction in similar countries with later implementation of screening. We assessed trends in breast cancer mortality in pairs of neighbouring European countries where mammography screening had been implemented many years apart. We also examined potential factors that could mask the influence of screening on trends in mortality observed within each pair. We selected pairs of European countries based on three criteria: the countries had to be neighbours; the countries had to have similar population structure, socioeconomic circumstances, quality of healthcare services, and access to treatment; and nationwide mammography screening in one country had to have existed since around 1990, with implementation some years later in the matched country. From information on mammography screening activities we summarised the population structure (for example, life expectancy, proportions of women in screening ages), socioeconomic circumstances, cultural environment, educational level, quality of healthcare services, and access to treatment for the 27 member states of the European Union, plus Norway, Switzerland, and Iceland. From these data, three pairs of countries met the selection criteria: Sweden and Norway, the Netherlands and Belgium, and Northern Ireland (United Kingdom) and the Republic of Ireland. For Belgium, we also sought data specific to the Flanders region, the area directly neighbouring the Netherlands where 60% of the Belgian population lives. We chose to take a closer look at Flanders as its medical culture, cultural background, socioeconomic status, language, and access to treatments are similar to those in the Netherlands. Belgium comprises two other regions, Brussels (10% of the population) and Wallonia (30% of the population), where French is spoken and where cultural patterns are more like those of France. Moreover, the organisation of mammography screening in Flanders was similar to the organisation in the Netherlands, whereas this was not the case for Brussels and Wallonia. Using information from published peer reviewed articles or reports we summarised mammography screening activities in each country for the 1990s and 2000-5.10 11 12 13 14 15 16 17 18 19 20 21 22 We defined organised screening as a population based programme to which women of defined ages were regularly invited to screening mammography. Non-organised screening was defined as screening left to the discretion of the women or doctors, without any centrally organised invitation or follow-up systems. In non-organised screening, women aged 40-49 seemed to be screened at least as frequently as women aged 50-69. For Sweden and Norway we used data on year of first invitation to screening. For Belgium, the Netherlands, Northern Ireland, and the Republic of Ireland we extracted data on attendance for screening in the past two years (three years in the United Kingdom) by women aged 50-64 or 50-69 (depending on eligibility in the respective organised programmes), whatever the screening modality. We extracted data on deaths from breast cancer registered in the World Health Organization mortality database as of May 2010 for the six countries for 1980 to 2006.23 In addition to WHO data, we obtained information on mortality statistics for Belgium. 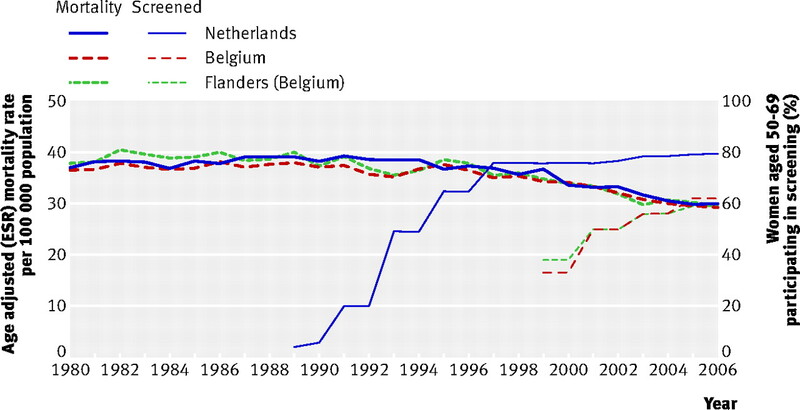 Specific mortality rates for Belgium were recorded until 1997, after which they became available for Flanders and Brussels until 2006, whereas for Wallonia mortality data were available only for 2004. For Wallonia we estimated mortality rates from 1998 to 2003, and for 2005 and 2006 by linear interpolation calculated with data for 2004 for all the countries and using data from 1989 and 2004 for Flanders and the Brussels region as a proxy for time trends in Belgium. We then estimated a national mortality rate for Belgium using regional rates weighted by population size. We used the age distribution of the European standard population to obtain European standardised age adjusted mortality rates. The analysis of trends in rates was based on knowledge that in 1989 a national screening programme was implemented in Sweden and that programmes were starting in Northern Ireland and the Netherlands. We fitted country specific Poisson regression models from 1989 until 2006 using annual numbers of breast cancer deaths and corresponding numbers of women by five year age groups. For the Poisson regression model specific to Flanders, we obtained annual population data by five year age groups from the Statistics Belgium for 1989 to 2004. For 1980-9, we used five year age groups reported by the population census in 198124 and age specific demographic groups available in 1989 for interpolating population numbers from 1982 to 1988. From the slope of each country we derived the annual percentage change in breast cancer mortality and the overall percentage change from 1989 to 2006 (1989 to 2004 for Belgium). We carried out these analyses for women of all ages and for women aged less than 50, 40-49, 50-69, 70-79, and 70 years and older. Analysis by age group was not possible for Flanders because age specific and region specific mortality data were not available before 1997. We analysed temporal trends in mortality among women of all ages using joinpoint regression, version 3.4.2 of the software from the surveillance research programme of the US National Cancer Institute.25 Joinpoint regression consists of fitting a straight line on a logarithmic scale to the trends in annual age standardised rates. While fitting the straight line, the joinpoint programme identifies (through permutation analysis) years during which statistically significant inflexions in trend occur. The user may decide a priori whether the programme should be allowed to identify one or several possible years during which significant inflexions occur. If only one joinpoint is allowed, then the programme will identify the year with the strongest change in trend. If two joinpoints are allowed, the programme will return the two years with the highest statistical significance. Joinpoint regression was done on data from 1980 to 2006 (1980 to 2004 for Belgium). We selected the minimum significant number of joinpoints identified from the permutation test and also extracted results for the model with one additional joinpoint. This enabled us to identify whether an additional non-significant downward trend could also be noticed. We examined several factors associated with breast cancer mortality, as differences in their prevalence could contribute to differences in mortality trends between country pairs. Of all lifestyle and reproductive factors, obesity (as measured by body mass index) at the time of cancer diagnosis seems to be the strongest factor associated with a poor prognosis.26 We used the prevalence of obesity in women aged 18 and older around 2000 that was available for the six countries,27 28 as well as data on obesity trends in the United Kingdom and the Republic of Ireland.29 The association of reproductive factors with breast cancer incidence is well established and the risk increases with decreasing fertility and increasing age at first birth. But the association with breast cancer mortality is less clear.26 However, we extracted figures on fertility (average number of children born alive per woman) and mean age at first birth from Eurostat27 and from other sources for Flanders30 31 and Northern Ireland.32 We used the available figures for the earlier year quoted for both countries of a pair. The national organised mammography screening programme in Sweden was implemented from 1986 onwards after a pilot study and the results of clinical trials carried out in the country in the 1970s and 1980s (table 1⇓).10 In 1990 about 90% of Swedish women had received a first invitation. Nationwide coverage was attained in 1997 (fig 1⇓). All women aged 50-69 are invited, but in most counties (60-70%) women aged 40-49 are also invited.11 In half the counties women aged 70-74 are invited. Attendance for screening in Sweden has been consistently among the highest recorded in any country.12 Non-organised screening is uncommon. The Norwegian organised mammography screening programme was initiated in 1996 as a pilot project in four counties, which include 40% of Norway’s population (Akershus, Hordaland, Oslo, Rogaland).13 14 Since then organised screening has been gradually implemented, with all women aged 50-69 invited every two years. By 2005 the programme had reached nationwide coverage. For the implementation of nationwide screening the time difference between Sweden and Norway was about 12 years. Non-organised screening was uncommon after implementation of the nationwide programme. From 1989 to 2006, breast cancer mortality decreased by 16.0% in Sweden and by 24.1% in Norway (table 2⇓ and fig 1). The United Kingdom organised mammography screening programme was introduced in Northern Ireland at the beginning of the 1990s (table 1).20 It includes women aged 50-64, who are invited to screening every three years. In 2003-4 the age range was extended to women up to age 70. Unlike the rest of the United Kingdom, Northern Ireland used two view mammography from the start. Attendance steadily increased during the 1990s and has remained stable, at around 70-75%, since 1995.21 Non-organised screening is uncommon. From 1989 to 2006, breast cancer mortality decreased by 29.6% in Northern Ireland and by 26.7% in the Republic of Ireland (table 2 and fig 3⇓). Table 2 summarises mortality trends for all women and by age group. In Sweden, mortality trends had steadily decreased since 19722 and screening implementation did not lead to a new inflexion in trends after 1972. 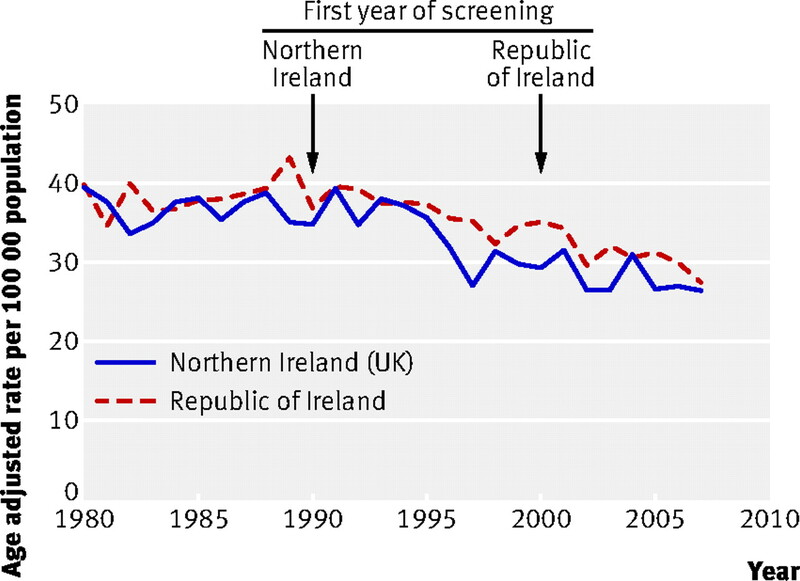 In Northern Ireland and the Netherlands, mortality started to decrease shortly after screening was introduced. In Belgium, Norway, and the Republic of Ireland, mortality started to decrease years before most women in the target age groups attended screening. In these three countries, when a second joinpoint was forced, the second year of inflexion in mortality trends always occurred before most eligible women participated in the screening. Overall, the greatest reduction in breast cancer mortality has occurred among younger women, aged 40 to 49 (table 2). This was also the case for Northern Ireland and Norway, where mammography screening before the age of 50 is rare. In women aged 70-79, the reduction in breast cancer mortality varied substantially by country, with strong reductions in the Netherlands, Norway, and the Republic of Ireland. The summary economic indicators suggest that average healthcare expenditures were higher in the Republic of Ireland and in Norway compared with Northern Ireland and Sweden, whereas the expenditures in Belgium and the Netherlands appeared to be similar. Uptake of recent anticancer drugs seemed to be slower in Northern Ireland than in the other countries. No data related to uptake of anticancer drugs were available for the Republic of Ireland. Trends in breast cancer mortality rates varied little between countries where women had been screened by mammography for a considerable time compared with those where women were largely unscreened during that same period. This is in sharp contrast with the temporal difference of 10 to 15 years in implementation of mammography screening and suggests that screening has not played a direct part in the reductions of breast cancer mortality. Studies at a population level are none the less limited by their inability to control confounding. It is therefore reasonable to question which factors could have caused the near absence of a difference in breast cancer mortality within the country pairs. We found no differences in risk factors for breast cancer or in access to treatment within each pair that could have counterbalanced the influence of screening associated with the decline in mortality. An as yet unknown confounding factor could obscure the relation between screening and mortality, but it is unlikely that this would have affected all three pairs simultaneously. It may be questioned whether the observation period was long enough for reliable comparisons to be made. The Malmö randomised trial, which is usually considered as methodologically robust, showed reductions in mortality eight years after the start of screening.40 41 42 At the population level, however, longer follow-up is probably needed because implementation of screening in the population is likely to take more time, and in our study the observation period was 18 years. In the Netherlands, a 20 year mortality follow-up after introducing mammography screening in the city of Nijmegen in 1975, showed that breast cancer mortality did not decline any earlier than in the city of Arnhem or in the Netherlands as a whole.43 Similar to our study, the investigators could not explain why the reduction did not start earlier in Nijmegen. Mammography screening aims to detect cancer before it is clinically apparent and before it has developed to an advanced stage. As suggested by the randomised trials, widespread organised screening would be expected to reduce the incidence of advanced breast cancer that should be observable years before reductions in mortality.6 44 However, in another study we showed that contrary to expectations, the incidence of advanced breast cancer in Northern Ireland and the Netherlands remained quite stable (similar data are not available for Sweden) subsequent to the implementation of screening.45 Those results suggest that follow-up longer than the 18 years of the present study is not likely to change the differences in mortality trends between the countries of each pair. Autier P, Boniol M, LaVecchia C, Vatten L, Gavin A, Héry C, et al. Disparities in breast cancer mortality trends between thirty European countries: retrospective trend analysis of WHO mortality database. BMJ2010;341:c3620. Jemal A, Siegel R, Xu J, Ward E. Cancer statistics, 2010. CA Cancer J Clin2010;60:277-300. Jones AL. Reduction in mortality from breast cancer: screening and increased use of adjuvants are responsible—adjuvants more so. BMJ2005;330:205-6.
International Agency for Research on Cancer. IARC/WHO handbooks of cancer prevention vol 7: breast cancer screening. IARC Press, 2002. Arbyn M, Raifu AO, Weiderpass E, Bray F, Anttila A. Trends of cervical cancer mortality in the member states of the European Union. Eur J Cancer2009;45:2640-8. Läärä E, Day NE, Hakama M. Trends in mortality from cervical cancer in the Nordic countries: association with organized screening programmes. Lancet1987;i:1247-9.
International Agency for Research on Cancer. IARC/WHO handbooks of cancer prevention vol 10: cervix cancer screening. IARC Press, 2005. Olsson S, Andersson I, Karlberg I, Bjurstam N, Frodis E, Håkansson S. Implementation of service screening with mammography in Sweden: from pilot study to nationwide programme. J Med Screen2000;7:14-8. Von Karsa L, Antilla A, Ronco G, Ponti A, Malila N, Arbyn M, et al. Cancer screening in the European Union, report on the implementation of the council recommendation on cancer screening, first report, Directorate General Health and Consumers, European Communities. 2008. http://ec.europa.eu/health/ph_determinants/genetics/documents/cancer_screening.pdf. Hofvind S, Geller B, Vacek PM, Thoresen S, Skaane P. Using the European guidelines to evaluate the Norwegian Breast Cancer Screening Program. Eur J Epidemiol2007;22:447-55. Kalager M, Zelen M, Langmark F, Adami HO. Effect of screening mammography on breast-cancer mortality in Norway. N Engl J Med2010;363:1203-10. National Evaluation Team for Breast Cancer Screening. NETB interim report 2007. Main results of breast cancer screening programme in The Netherlands. NETB, 2007. Vandenbroucke A, Bourdon C. Breast cancer screening programmes—results of studies in foreign countries—situation in Belgium. Eur J Cancer Prev1993;2:269-74. De Bock C, Fabri V, Remacle A. Succès contrastés du programme de dépistage du cancer du sein. Education Santé, No 246. 2009. [French.] www.educationsante.be/es/article.php?id=1127. Fabri V, Remacle A. Programme de dépistage du cancer du sein: comparaison des trois premiers tours 2001-2002, 2003-2004 et 2005-2006. Rapport numéro 6 de l’Agence Intermutualiste. [French and Dutch.] 2009. www.nic-ima.be/fr. Kee F, Telford AM, Donaghy P, O’Doherty A. Attitude or access: reasons for not attending mammography in Northern Ireland. Eur J Cancer Prev1992;1:311-5. HSC Public Health Agency. NI cancer screening programmes. 2011. www.cancerscreening.n-i.nhs.uk/statistics/. BreastCheck—The National Breast Screening Programme. Programme report 2008/09. Irish National Cancer Screening Service Ireland, 2009. World Health Organization. Mortality database. 2010. www.who.int/healthinfo/morttables. Institut National de Statistiques. Recencement de la population et des logements au 1er mars 81. 1982. http://economie.fgov.be/fr/binaries/01_fr_tcm326-33744.pdf. National Cancer Institute. Joinpoint regression program, version 2.7. 2011. www.srab.cancer.gov/joinpoint/. Barnett GC, Shah S, Redman K, Easton DF, Ponder BAJ, Pharoah PDP. Risk factors for the incidence of breast cancer: do they affect survival from the disease? J Clin Oncol2008;26:3310-6. European Commission. Eurostat database. 2011. http://ec.europa.eu/eurostat/. Boniol M, Autier P. Prevalence of main cancer lifestyle risk factors in Europe in 2000. Eur J Cancer2010;46:2534-44. Association of Public Health Observatories. International comparisons of obesity prevalence. National Obesity Observatory, National Health Service (NFS), 2009. Van Bavel J, Bastiaenssen V. De evolutie van de vruchtbaarheid in het Vlaamse Gewest tussen 2001 en 2005. Interface demography working paper:2006-1. 2006. www.vub.ac.be/SOCO/demo/intro.htm. Goed Gevoel. Gezondheid/psycho. [Dutch.] 2011. www.goedgevoel.be/gg/nl/449/Geboorte/article/detail/1126704/2010/06/29/Vrouw-nooit-zo-oud-bij-geboorte-eerste-kind.dhtml. Statistics Press Notice. Births in Northern Ireland (2006). Northern Ireland Statistics and Research Agency, 2007. Jonsson B, Wilking N. A global comparison regarding patient access to cancer drugs. Ann Oncol2007;18(suppl 3):1-74.
WHO Statistical Information System. 2011. www.who.int/whosis/. Donnelly DW, Gavin AT, Comber H. Cancer in Ireland 1994-2004: a summary report. 2009. www.qub.ac.uk/nicr. Herman PM, Walsh ME. Hospital admissions for acute myocardial infarction, angina, stroke, and asthma after implementation of Arizona’s comprehensive statewide smoking ban. Am J Public Health2011;101:491-6. Nyström L, Andersson I, Bjurstam N, Frisell J, Nordenskjöld B, Rutqvist LE. Long-term effects of mammography screening: updated overview of the Swedish randomised trials. Lancet2002;359:909-19. Anderson I, Nystrom L. Mammography screening. J Natl Cancer Inst1995;87:1263-4. Miettinen OS, Henschke CI, Pasmantier MW, Smith JP, Libby DM, Yankelevitz DF. Mammography screening: no reliable supporting evidence? Lancet2002;359:404-6. Broeders MJM, Peer PGM, Straatman H, Beex LVAM, Hendriks JHCL, Holland R, et al. Diverging breast cancer mortality rates in relation to screening? A comparison of Nijmegen to Arnhem and The Netherlands, 1969-1997. Int J Cancer2001;92:303-8. Autier P, Boniol M, Middleton R, Doré JF, Héry C, Zheng T, et al. Advanced breast cancer incidence following population-based mammographic screening. Ann Oncol2011; published online 20 January. Otten JD, Broeders MJM, Fracheboud J, Otto SJ, de Koning HJ, Verbeek ALM. Impressive time-related influence of the Dutch screening programme on breast cancer incidence and mortality, 1975-2006. Int J Cancer2008;123:1929-34. Jørgensen KJ, Zahl PH, Gøtzsche PC. Breast cancer mortality in organised mammography screening in Denmark: comparative study. BMJ2010;340:c1241.